In her book Starting from Scratch, One Woman’s Pursuit of Family, Business, and the American Dream, Shelly recounts what is was like to go all in as a wife, mom, entrepreneur, and more. This warm account is peppered with wisdom from one woman who has done it all and is continuing to lead others toward the pursuit of happiness. Would you like to receive a free book? Invite Shelly to speak at your next event, and she will bring one to the event and sign it for you. Shelly can speak on life as a business owner-mom-wife-sports enthusiast, and she can share about the triumphs and trials of managing it all. Shelly reminds us that it's not too late to start from scratch and achieve your dreams. You will love Shelly's light-hearted and positive approach to life, while not straying from her values or the realities of life. Contact Shelly today using the form below. Born in Detroit, Michigan, Shelly Henderson has called Charlotte home for 44 years. As co-founder of Henderson Properties along with her husband, Phil, Shelly manages the full-service real estate company’s corporate culture and branding via content marketing and social media strategies. She also runs the company’s leadership development courses for employees. Previously, Henderson managed accounting, human relations, rental property management and maintenance services for the company. Henderson graduated from Appalachian State University in 1987 with a degree in elementary education. Prior to starting Henderson Properties, Henderson worked as an elementary and middle school teacher then pursued her dream of professional golfing for a year on the LPGA Futures Tour. She is a proud mother to Blake, 22, a senior at Hampden-Sydney College, and Grant, 20, a sophomore at the University of Alabama. Henderson believes in giving back to the community and volunteers with JDRF’s Charlotte chapter. The organization is committed to funding Type 1 diabetes research in search of a cure. She currently serves as the Ritual Chair for Appalachian State University’s Sigma Kappa Theta Alpha chapter and was recently named Advisory Board Supervisor for the University of Delaware’s Sigma Kappa Theta Delta chapter. She also supports Christian Library International, which collects and distributes Christian books and Bibles to prisons across America, and Second Harvest Food Bank, which distributes food to area food pantries. In her free time, Henderson enjoys attending sporting events, traveling and curling up by the fire with a good glass of wine. 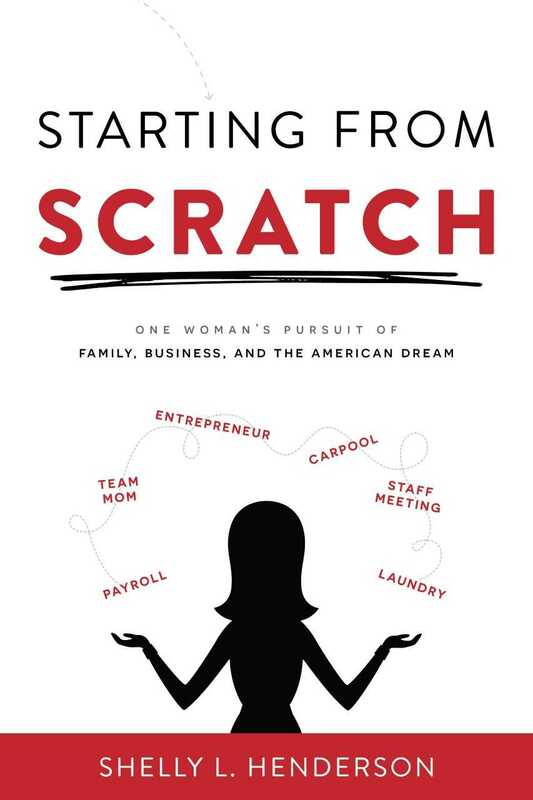 Starting from Scratch: One Woman’s Pursuit of Family, Business and the American Dream is her first book. Follow Henderson on Twitter at @shenderson3243. Are you interested in having Shelly Henderson speak at one of your upcoming events, fill out your information below.